Page 2: The Handbook and defensive flicks 1970s-2000s. 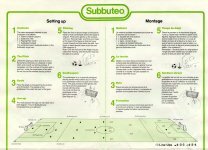 Subbuteo Basic Rules 1947-75, 1976-2002 (this page). Subbuteo Catalogues: 1947-1960, 1971-1996, and Misc. flyers. As with most Subbuteo, the early years of the rulebook are characterized by slow change, whereas the later years see several big design changes, and complete rewrites. This amalgamated rule book arrives in the late 1970s. It has the result of the 1974 Subbuteo World Cup on the back page, and I obtained copies from my original 1979 Club Edition, and a 1976 Display set. It is a twenty page book, which contains the Elementary rules, Advanced rules, and Spin booklet all in one. This makes it a bit confusing and complicated (well it did for me when I was nine years old). Partly this is down to contradictions between basic and advanced rules. It is a bit of a "cut and paste" job to be honest. It starts with GC Samson's personal message from the advanced rule book (C116) - altered slightly to fit this new role. Then we get the pitch section - and we find that "The Playing Pitch" from the elementary rules, has been replaced by the more detailed "On setting out the game" section - again from the advanced rules. "The line up" paragraph actually expands to fill its own section. Following on, we find "Playing the Football Figures" has been merged with the small "The Secret of Success - Fingertip Control" chapter from the advanced rules, with the resulting section adopting the name of the latter. "Direction of the Ball" is next, which takes its name from the Advanced rules section, but also plugs (and illustrates) the new special corner kickers and throw-in takers. After all that, the handbook finally moves on to the elementary rules of play. These start with "The Kick off and After" as per the previous edition. This is followed by "Playing time - extra time etc...". This section still recommends twenty minutes each way, but also has new rules for deciding the outcome of deadlocked competition matches. This is five minutes each way of extra time, followed by a shoot out. The shoot out consists of five shots from along the shooting area line (on both touchlines, opposite the corners of the penalty area, and from behind the corner spot). The goalkeeper is not confined to his line during the shoot out, but has to remain stationery until the kick is taken. Goalscoring - The ball must now be "fully over the (shooting) line" rather than the previous "more in than out." before you can shoot. I guess this is designed to cut down on arguments, and the need for Russian linesmen. The Throw-in - The special throw-in figure (C132) is added. Positioning of figures - This now gets a little confusing. The rule still states that "figures may be placed in position for the taking of goal kicks and free kicks", but also says "for free kicks two figures of each side may be flicked into position". I assume this is to counteract the fact that you are not allowed to place figures in the opposing shooting area. Under the old rules you could move lots of players about, but you couldn't set up any attacking players. Not helpful on free kicks in and around the shooting area. So now we have the easy(ish) to remember sliding scale of free flicks. Corner = three, Free kick = two, and throw in = one. The elementary section in these rules ends with "free kicks and free flicks", "winning tactics" and "Sportsmanship" sections, culled once again from the old advanced rules booklet. The handbook then goes onto a new version of the Advanced Rules. These were designed with tournament play in mind, and have detailed rules for dealing with virtually any situation that might occur during a game. I think the advanced rules need to be dealt with on a separate page, which I will add in due course, but I want to mention a key addition. Firstly, these rules have seen major changes. The Advanced rules had previously received revisions in 1953-54 and then again in 1968-69. However, there has been a complete rewrite here, and many of the rule numbers have changed - i.e. "Rule 10: Injured Man", becomes "Rule 9: Injuries". However, the biggest change is the new rule six, or the "Defensive Flicks" rule. This is where the side not in possession gain alternate flicks for defensive purposes. The old advanced rules had a limited form of this (three alternate flicks when opponent crosses the halfway line), but this is the first time unlimited alternate flicks appears. The fact that this is also the first time the Advanced rules appear within the standard box set, means that bedroom floor players can discover this strange new way of playing lurking in the complicated bit at the back of the rulebook. My friends and I choose to ignore the rule, and carry on playing the way we were - we lost position often enough without breaking up play any further! However, this rule arrives in the basic version of the game in the mid 1980s, as we shall see below. The handbook finishes with the Spin! booklet diagrams, a questions and answers section, a page on organising a league, and details on how to make your own playing board. This small fold-out sheet was included with the 1981 editions. After the overblown handbook, we are back to just the basics, with the advanced rules relegated to C192. With the same front cover illustration as the Handbook, this sheet is basically just the introduction and Elementary rules from that book. The only differences are that the "On setting out the game" section has been heavily cut down, and a "Floodlight Assembly Tips" section has been added. As we reach the mid 1980s, the different international versions of Subbuteo disappear, to be replaced by universal sets. These sets eventually lose the old familiar names such as "Club Edition", leaving the boxes devoid of English text. To match this, a new large fold out rule sheet was produced with the rules printed out in six different languages. The sheet is double sided, with one side covering how to set out the game and its components, and the other side looking at "How to Play" - the actual rules of the game. This set of rules lasts right through the Waddingtons era, with identical sheets appearing in the 1985 Club Edition and the Euro '96 edition eleven years later. The rules are not even updated to change the Subbuteo reference numbers from Cxxx to 63xxx. As the rules have been completely re-written and also include some major changes, I've decided to include the whole set of rules on this page. The text in italics is written exactly as the rule sheet - I've not tidied up their use of quotation marks etc. This is a very basic rundown divided into six short sections, as set out below. Goals - Simply place where goals are supposed to go - well duh. Obvious advice on goalkeeper's handle too. Line-up - "the most popular line-ups are 4-2-4 and 4-3-3 (see diagram 1)". To me, diagram one seems to show a 4-2-4 formation and a 3-3-4 one. But that's okay because "any recognised line-up is allowed". Goalkeepers - More obvious advice and a reminder that "You must not flick the goalkeeper at the ball by the handle." Side 2: How to play. The new system is divided into ten rules with a separate section on fouls. Playing Time - "The game normally consists of two equal halves of 10 minutes with a 2 minute break after the first half." Do kids really have shorter attention spans nowadays? Subbuteo seem to think so, as the length of matches is reduced once again. Kick Off - "The side in possession is the attacking team. The other side is known as the defending team. Each team must be in its own half of the field at kick off, with the defending team outside the centre circle. The centre figure in the attacking team now kicks the ball, which must go forward into the other half of the pitch. If the ball does not touch an opposing figure then the team who kicked off still controls the ball. The figure that kicked the ball may not touch the ball again until it has been kicked by another team mate." No different to real football. In all cases possession goes to the other team. Passing - "When passing, it is not necessary for the ball to hit the figure you are passing to. When the ball hits a figure after a pass, that figure is still allowed up to three flicks with the ball." Both bits of information here were not in the original rules, but seemed obvious to me as a kid. I guess a clarification doesn't do any harm. Defending - "To try to break down an attack, the defending team may take one 'blocking flick' after each flick made by the attacking team. The attacking team does not have to wait for the defending team's flick. If the defending team does not take his flick, he forfeits the move. You must not touch either the ball or the attacking figures when taking a blocking flick. If you do hit them, the figures involved and the ball must be put back to their original positions and the defending team loses that 'blocking flick'. Then rather unnecessarily, the rules add "The blocking flick should be used to obstruct the attacking team's move." And so the defending flick reaches the basic rules. While this rule makes for amazingly fast and skilful tournament play, I find it slows down and frustrates basic level players (like me). Scoring - "A goal can only be scored if the attacking figure is in the defending team's half, and the ball is completely in the shooting area. Any goal scored from elsewhere is disallowed and the game is restarted with a goal kick. "However, all own goals, scored from inside the attacking team's own half, count as goals to the opposition. A goal counts as soon as the ball crosses completely over the line. You do not have to wait for the goalkeeper to be ready." The own goal rule sounds a little confusing, but its important to remember that the attacking team is the one in possession - even if this is inside their own penalty area! Goal Kick - "If the ball goes over the goal line and was last touched by an attacking figure, the ball is put back into play with a goal kick. Place the ball on the corner of the goal area and use a nearby figure to kick the ball up the field. The goalkicker must not touch the ball again until it is first touched by another figure. The figures in the opposition's half can only be moved sideways or backwards towards your own half. They must not be moved forward. Figures in your own half can be moved in any direction, but not into the opposing team's half. Figures should not be placed closer than 12mm (0.5 inch) from an opposing figure. This was previously in the advanced rules, and stamps out a bit of gamesmanship. "Goal kicks can also be taken using the specialist goalkeepers/goalkicker (Subbuteo ref. C106/C201/C202/C203). Corner Kick - "If the ball goes over the goal line and it was last touched by a defending player, the ball is put back into play by a corner kick. Place the ball and a figure on the corner spot. Each team may position by flicking three players; the attacking team flicks first. The corner is taken with a flick and the figure that took the corner is not allowed to touch the ball again until it has first touched another figure. "Corner kicks can also be taken using the specialist Corner Kick Figures (Subbuteo ref. C131). Final Result - "If a winning result is required from a game but you have a drawn match, extra time or a tie breaker can be used to decide the eventual winner. After a break, two three-minute periods are played, Change halves at half time. If after this time, it is still a draw, a 'Shooting Tie Breaker" is needed. One of the goal areas is chosen and each team has five 'one-to-one' shots in succession from the positions shown in diagram 4. The goalkeeper is not confined to the goal line, but he must remain stationary before the lick is taken. After each team has taken five shots, the team with the the highest score wins. If the game is still tied, continue with the 'Shooting Tie Breaker' until one team has scored more goals. These extra shots should be alternated between each team. The final section of these rules is a list of the possible foul play in the game, and what the resulting awards should be. Offence: An attacking figure hits a defending figure before touching the ball. If the foul occurs outside the shooting area, an indirect free kick is awarded to the opposing team. If the foul occurs inside the shooting area but outside the penalty area, a direct free kick is awarded to the opposing team. If the foul occurs inside the penalty area, a penalty kick is awarded to the opposing team. NB: If the figure does not touch the ball - there is no foul, but possession goes to the opposition. This is not how this rule used to work, and it strikes me as a little silly. I can't imagine there would be many fouls at all in a game using these rules. there are at least two of his opponent's figures (including the goalkeeper) nearer their own goal line than he is. he is outside the shooting area, or there are at least two figures, including the goalkeeper, inside the shooting area. the ball has passed the last defender. the ball is received from a throw-in, corner kick or goal kick. Award: An indirect free kick is awarded to the defending team from the point of the offence. Note: When an attacking team is in possession and sees that he has a figure in an offside position, he can flick that figure into an onside position. Only two 'onside flicks' are allowed during each turn. The defending team is allowed one 'blocking flick' for each 'onside flick'. The 'blocking flicks' must be used to mark up the figure flicked on-side. This rule sheet doesn't seem to explain what a "turn" actually is. The 1997 Hasbro rule book states "remember, a turn means any period when a team is in possession, however long or short that period is". I'm not sure where they told us in the first place for us to remember. I'm not sure that parts 'b' and 'c' of the offside rule make any sense. Hasbro seem to agree - see below! Offence: Figures moved in a way other than the 'flick-to-kick' method, including positional flicks, on-side flicks and blocking flicks. One figure kicking the ball more than three times in a row. Award: An 'indirect' free kick is awarded to the opposition in all cases. Offence: A player touching the ball with the hand. Award: See awards for (A). This section finishes with the rules for penalties and free kicks. All figures apart from the goalkeeper and the figure taking the penalty must be placed outside the penalty area. The goalkeeper and its base must be touching the goal line in the centre of the goal mouth, and remain stationary before the kick is taken. (If this rule is infringed three times, a goal is awarded). The player taking the penalty must declare that he is ready to take the penalty." Direct and Indirect Free Kicks. "With an 'indirect' free kick the ball must first touch another figure before a goal is scored. With a 'direct' free kick, a goal can be scored direct from the kick, provided that the ball is completely within the shooting area." (a direct free kick shouldn't have been awarded if it was outside the shooting area anyway). "For a direct free kick within the shooting area, the defending team can place up to four figures to form a wall 9cm from the ball. This is in addition to the two flicks for marking." This is another rule that used to be confined to the Advanced section - but which is sensible and good fun to use. "When taking a free kick, there should be no defending figures within 9cm of the ball. (another sensible clarification). For free kicks, each team can flick two figures into a new position before the kick is taken. The attacking team flicks first." The 1997 Hasbro Rule Book. In the Euro '96 set the green rule sheet had become two sheets, with the same rules explained in even more languages. When Hasbro took over production in 1997, they produced an A4 booklet which incorporated eight of these languages (English, French, German, Dutch, Italian, Spanish, Portuguese, and Greek). The rules in the booklet are revised and rewritten - but not in any significant way. The rules are made a bit more chatty, and a couple of logical explanations are added. The Setting Up section is reduced to a couple of paragraphs, alongside assembly illustrations on the inside of the front and back covers. The rules are again divided into ten sections, with a separate chapter on fouls. The main differences are in the "fouls" section. The standard foul where the attacking player hits a defending footballer before touching the ball is still only a foul if the player also goes on to hit the ball. This rule is now known as "obstruction", so there is no miniature representation of your standard hack at all !! The "offside" rule now sensibly drops parts b) and c). If there is no referee, it is up to the defending team to spot the situation and "shout 'offside!' to stop the game". As before, two onside flicks are allowed per turn. Another change is in the throw-in section. The requirement that the throw in taker not cross the touch line, when taking the throw, has now been dropped. 2000/2001 Man Utd Edition Rule Book. This is the final Hasbro rule book to be produced (well, so far!). Once again we see the rules rewritten. This time the rules have been divided into easily managed chunks spaced out with little illustrations as shown below. Although the illustrations are on Subbuteo bases, a couple of them seem more reminiscent of players in Hasbro's other football game, Pro Action Soccer. As usual, you can find small changes in the rules . I've spotted that when moving players for a goal kick, you are now not allowed to move them closer than 1cm to an opposing figure, rather than the previous 12mm. The extra 2mm makes all the difference! The final changes are for dealing with drawn matches where a result is needed. The "golden goal" rule for extra time is given as a option, and the penalty shoot out is now taken from the penalty spot, rather than the five spots on the shooting line. That seems to be about it for the basic football rule books., although there are still the advanced rules, international rule books, to cover. I've now added cricket and rugby rules to this part of the site, and hope to add other games shortly. Subbuteo Catalogues: 1947-1970, 1971-1996, and Misc. flyers.